43 % of the golf shots are putts, however, putting is rarely trained systematically. Neuroscience tell us that efficient learning is all about accurate feedback. 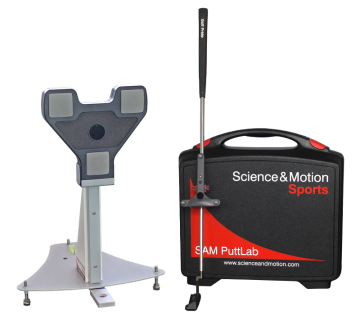 SAM PuttLab offers the most efficient technology to train for ascertainable success. Testimonials of many Instructors and PGA Tour Pros attest the unique abilities of SAM PuttLab (See our Testimonials). SAM PuttLab is the worlds most accurate and comprehensive putt analysis and training system. Other technology lacks accuracy, which is so much needed for putting, or only measures few aspects of the putting stroke. The PuttLab 6 software with app remote control and Report Builder module is now available (More info on PuttLab App). See all graphic reports & profiles – a perfect presentation of results! SAM PuttLab analyzes more than 40 important parameters of your putting stroke and displays the results in easy to understand graphic reports. Discover your individual strengths and weaknesses for a better and more efficient training. © Banners Golf. All Rights Reserved.